The last 'Sapa' season. The advantage of working with a sponsor for longer than a season was very evident when the shirts were printed with the logo already incorporated - not as has tended to happen since, added subsequently. Even now, holding one of these shirts tends to bring back the 'old days' when County were a more flourishing club and the kit and merchandise reflected that. 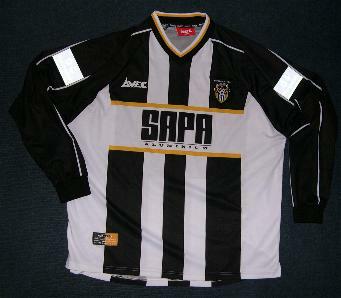 As well as a longer sponsorship deal, the Avec name meant a quality to be reckoned with - a good cut, a nice collar, a material that was hard-wearing and a well-thought out design incorporating the historic black and white with a hint of yellow (the modern day gold) on the trim. 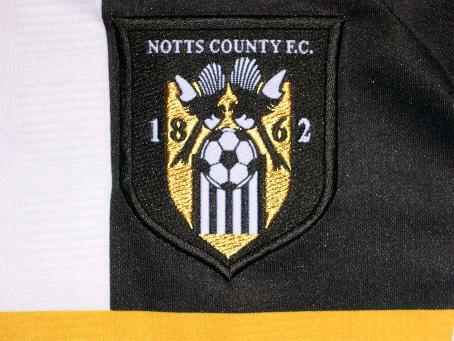 The badge was also well sewn - not hand-knitted as subsequently.Altogether marvellous ! As you might expect with such a decent name, most of the players kits survived the season intact. Again, a feature of the 'old days' was that most regulars had at least three shirts and they were short or long sleeved. All the players kits have the misleading 'authorised merchandise' label at the bottom as do the replicas. However, there is a key difference between the two types. The players shirts have black blocks on the back which carried the white official Football League numbers of the day. The sale shirts just had stripes all the way down. In addition there were obligatory 'Nationwide' epaulettes. You will find these on all sleeves and for this year, they were rectangular and blue plastic finish - quite durable. However, these were available to buy seperately in the shop so it was possible to add them by ironing. 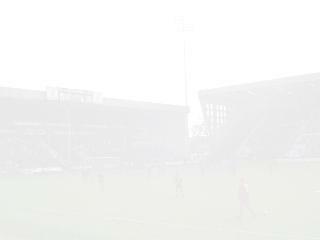 The players kits came up for sale in the club shop at the beginning of the following season with the price tag of £55. 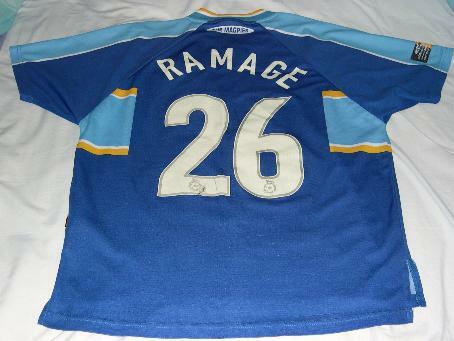 Later this dropped to £25. No goalkeepers shirts were sold from this season. Player issue first team shirt reverse showing the black block exclusive to the teams kit. 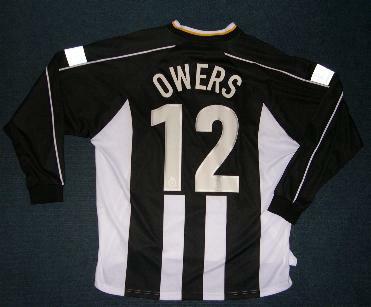 Gary Owers was in the twilight of his career when he moved to Notts as his squad number indicates but he brought much needed experience and captained the team on occasions.His last appearence on the team sheet was on the subs bench on the final day of the 'Great Escape' season.He probably would have been happier in red and white stripes as he spent many years at Sunderland and appeared in an FA Cup Final against Liverpool in 1992. 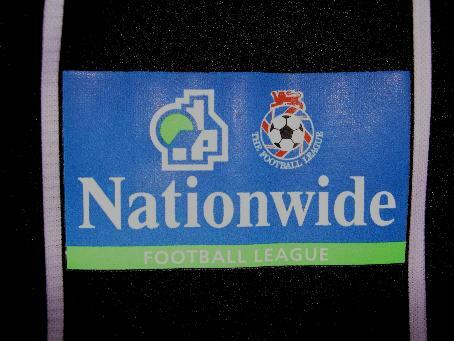 Nationwide epaulettes - standard on the player issue ! Badge of Distinction ! Nice quality needlework there missus ! Smashing - a second shirt that's as good as the first !. The second shirt for this season was also a nice piece of kit. Incorporating the yellow and again with the sponsors name printed on, this shirt had a blue lining around the badge and the Avec logo. It remains popular today when it pops up on Ebay as a replica. The players shirts themselves did appear for sale in a smaller quantity. 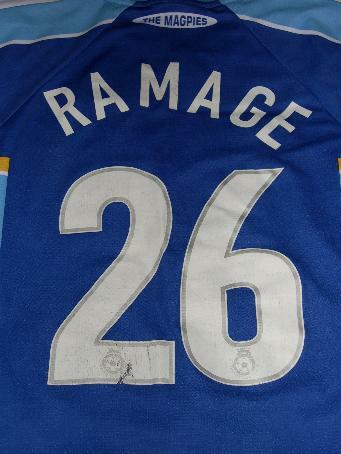 Craig Ramage has not offered his shirt here - this is a replica as you can see if you look at the close up of the lettering. Although its similar to that used on the players kits, it's slightly smaller. The third kit was marketed as a replica so you may see some around although it remains quite a nice item for the collector to get hold of as its not that common. The strip was all white - shirts and shorts. 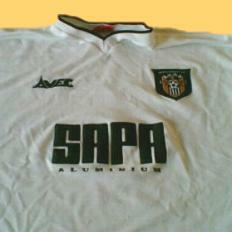 The only adornment to the shirt was black lettering - SAPA on the front and black edging on the collar. There was a team badge and the Avec logo as well. 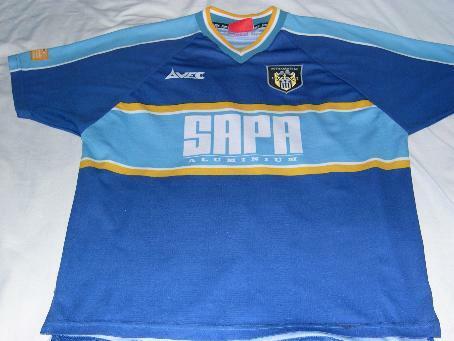 Like all the later third kits, it wasn't worn much so you might find one in good condition.